I haven't done a Life Lately update in a little while. I may start doing these once a month, it's fun to look back at the progress of the previous month in business and in life, and to have an easy chat with you about what's been going on behind-the-scenes here! Let me know if you'd like to see more posts like these in the comments. 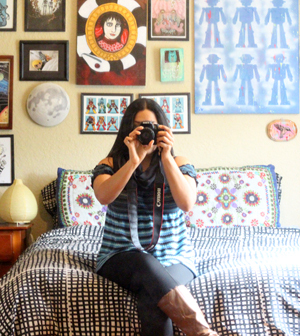 Above is a shot from yesterday, I have my set-up for market days set up in my apartment living room! I'm selling booth this Wednesday's Art Walk and now new weekly at UNF market days. I'll be at UNF from 10am to 2pm and at Art Walk from 5pm to 9pm. 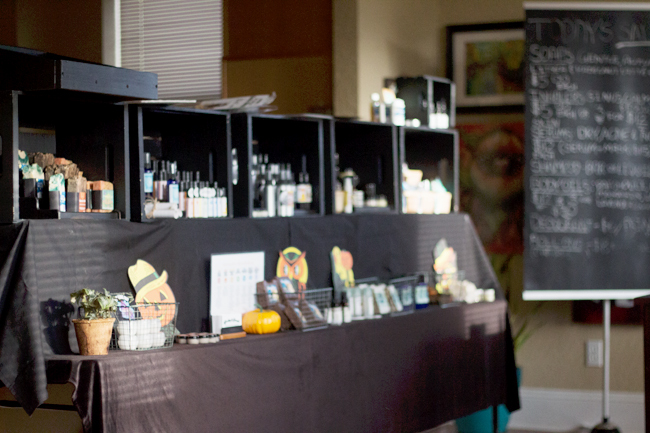 It's been so fun to let loose and design new labels, products, and a table set-ups like crazy. I feel I had a breakthrough recently about why the new set-up didn't feel quite "right" - the "kitsch" was missing, the playful retro imagery that makes the brand distinctly "me". I won't forget it going forward. It's retro crafting time! I'll be making a new line of vintage things (or two, small ones) behind-the-scenes. Our recent mid-August trip was a big help with fixing my mindset on things I was spinning my wheels on. Suffolk Virginia is filled with open farm land and looking at the fields of Tobacco, Corn, Soybeans and other crops was awe inspiring and relaxing! 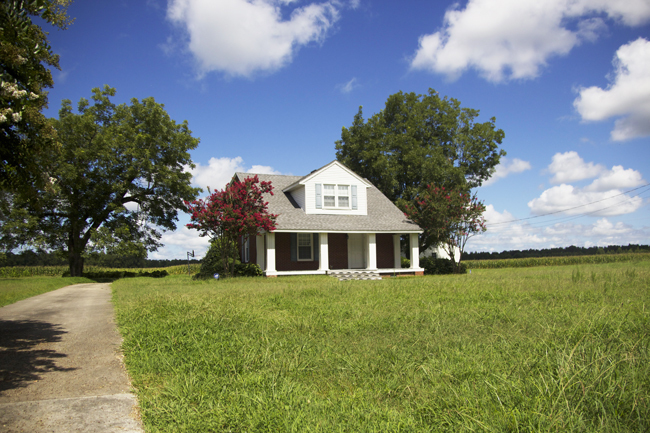 The house above is surrounded on all sides by empty land and cornfields with trees in the distance. It's AJ's great aunt and uncle's former home where he'd stay when he'd visit family in Suffolk. I think I'll dedicate a future post to this soon but, deer! DEER! I know people who live more rural areas get to see these gorgeous creatures in their back yards all the time but not I, living in an urban area minutes from downtown! (Though last night instead of six deer there were six cop cars right outside my front door. I love living here, and it's a lot quieter than it was when I first moved in, but peaceful deer nibbling on fresh grass would be nicer than sirens!) There was only one other time I saw deer so close to me, in Rochester, New York a little over a decade ago. 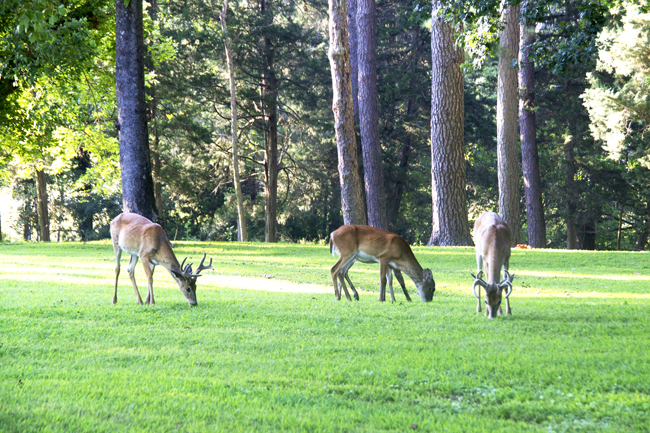 I took plenty of photos of these lovely bucks, does, and fawns hanging out at the historic Jamestown site in Virginia. Last month I also did yet another aggressive purge, selling off more items I loved, but that I could now live without. 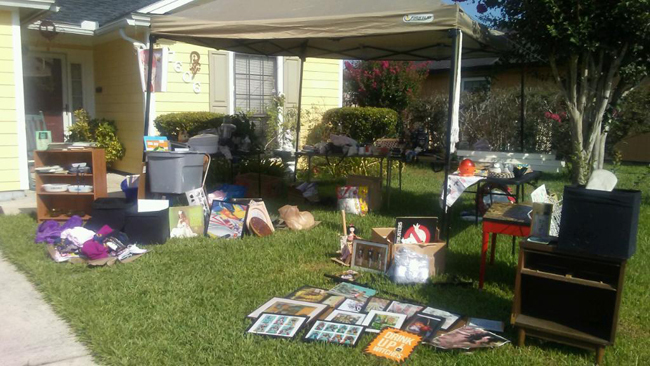 I took a quick shot on my mom's cell phone of the sale I hastily set-up at my parent's house. Not photogenic but I was exhausted and it got the job done! I actually made a decent amount for something I didn't promote much. I will continue to purge and sell! I'm actually helping some other clients purge their belongings and get organized, too. It's draining but very fun and rewarding work! I that was my full time job alone it would be incredibly satisfying, you see people come alive when they let go of the "past" to allow the "present moment" into their lives. I'm slowly collecting vintage Halloween goods and making retro Halloween crafts this year! I'm excited for haunted houses, hay rides, and traveling to explore corn mazes! And of course, I've been working on watching horror movies all year. I've already added some to the "new favorites" roster in September alone! Can't wait to go all out and decorate my booth and home for Halloween! 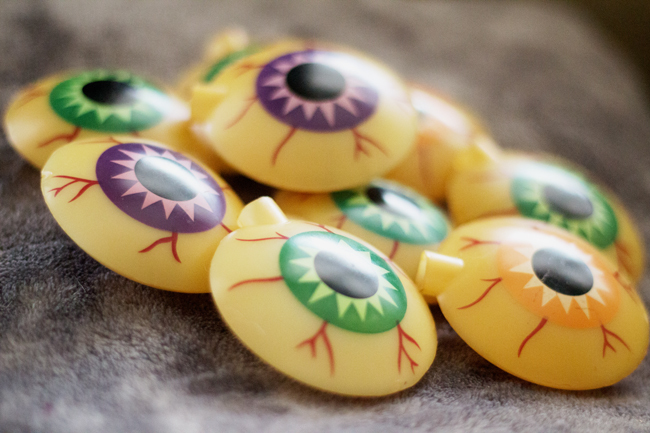 The photo above are some vintage eyes that go over string lights for Halloween. And of course I've been formulating new products along the way. I could keep going with this new aromatherapy inhalers line but it feels well-rounded for now. It's been doing very well! It's aromatherapy on-the-go. You unscrew the cap and inhale deeply, the small essential oil molecules pass the blood brain barrier for an instant health boost. 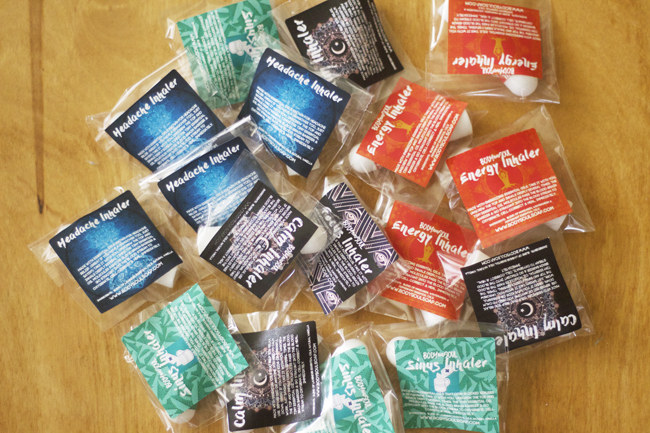 I have Sinus, Calm, Energy, Headache and Focus blends. It was something I almost wasn't going to put out but the community apparently needs that healing because people have gravitated toward it! And you can't start September without some Autumn Spice Blends! 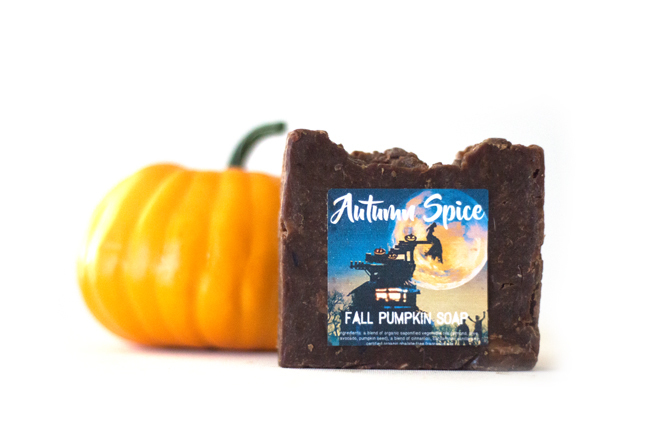 I have Autumn Soaps and body oils right now. Of course if you ever want anything you see send me an e-mail. I send out free goodies with every order. :) I'm almost done with the fresh new store and matching blog for this brand. Overall, early to mid August was a time of rest (for one week, haha) and figuring out some wheel-stopping issues, and late August and early September have been incredibly productive and creative times! I'm so excited to keep the momentum going! I've scheduled time to get to work on some new giveaways, e-books and services that I'm excited to share soon. How has life and business been for you lately? Was the 2016 heatwave just as insane where you live? I love your booth set up! The fall colors are wonderful. I feel like I'm not quite ready to admit that it's fall, harvest season, with halloween decorations coming up, but it's definitely here! I enjoy reading behind the scenes, work in progress posts. I vote for more of them! You've been busy Vanessa! 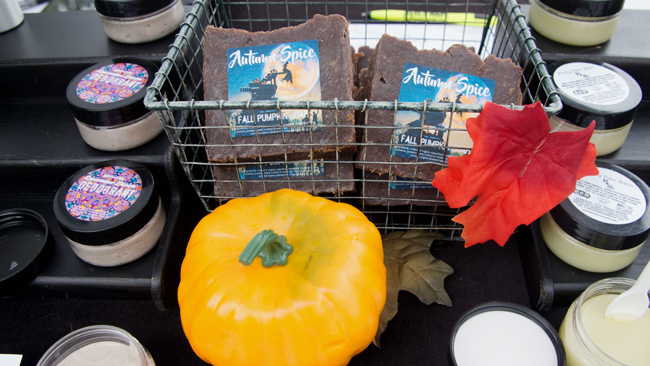 I love the Autumn Spice soap and I can't wait to see your crafts you've been working on. It was hot here for awhile but back down to normal now. I deleted two paragraphs whining about how hot it was from the post, haha. We've had AC issues; first-world problems. Glad it's cooled where you live. :) I can't wait to share the craft posts. I NEED SOME OF THAT HEADACHE INHALER STAT!! ALSO LET ME KNOW ABOUT YOU SOAP LINE. Sorry for posting without the website up for easy viewing and ordering, I need to hurry it up! It was amazing to take picture after picture of the deer with my loud camera shutter and these guys were mere feet away and barely moving. I love how they're just all out and about near people's homes in more rural US! I'm a city girl at heart too, I love the hustle and all the art, culture and food at walking or easy-commute distance. It's a hard choice because nature is so gorgeous and nurturing and I ADORE it but I'd eventually miss interacting with people. I imagine a future where I can combine elements of both regularly. Hi Vanessa, The heatwave was pretty bad here in PA - mostly due to the humidity. For jewelry sales, summers are always pretty much slow... July-Aug pretty much comes to a dead stop since folks are spending their $ on vacations (so that's when I try to blog more, take lots of photos outdoors and work on inventory for the holidays) but things have just started to pick up. I love that autumn momentum! I'll miss the warm summer weather but love the bustle of fall. Your setup looks good. I don't do any live shows anymore and sometimes I miss the "live" interactions. Good luck with your sales!